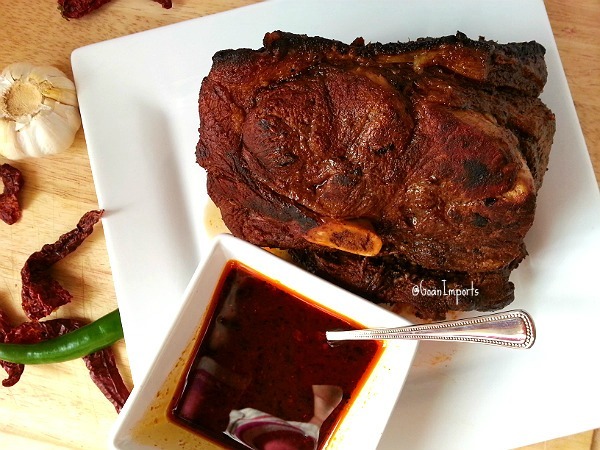 If you are looking for a spiced pork roast recipe for the holidays or for your Christmas meal then this recipe will definitely not disappoint and will make you want for more, just like my husband and 6-year-old son. It’s also called Assado De Leitao (Roast Pig) in Portuguese and is made for weddings and feasts (In Goa we celebrate a lot of church feast). Making this recipe made me feel so nostalgic that I was thinking how come I never made it before. The good part of this recipe is the left overs, which is great for sandwiches. Just apply butter to bread and put in thinly sliced meat and its so yummy. Also this recipe can be used to make Beef roast. You can cook the pork a day or two ahead of time. Looking at the ingredients it may look like a lot of spices, it’s not as spicy but has a great flavor. * Wash the meat well and pat it dry with paper towel. Prick it with a fork all over. Apply 2 tsp of salt and keep aside. * Grind ginger, garlic, green chilli, 1 tsp of sugar in 3 tbsp of vinegar. Please do not add any water. 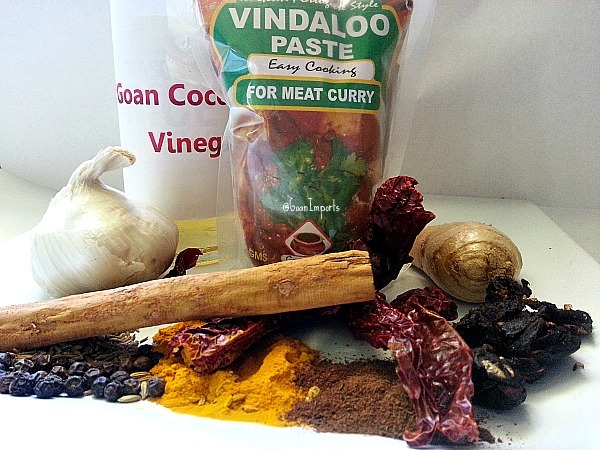 * Add this ginger-garlic paste to 3 tbsp of vindaloo paste mix well and apply to the meat. (If you need u can use gloves to do this). Refrigerate overnight well covered. * Heat a pan with oil and sear/brown the meat on medium for 4-5 minutes on each side. Do not discard the marinated liquid. * Take the meat out and clean the pot of all the burnt bits with a spoon. Add the meat back and pour in 3 cups water,the marinated liquid, 1/4 tsp of sugar, 1 1/2 tbsp of ketchup and salt to taste. Cover and cook on medium heat for 1hr and 45 minutes. Turning the meat every 10 minutes. The liquid will reduce and thicken with a bit of fat. * This step is optional if you like. This is how it is done in Goa. 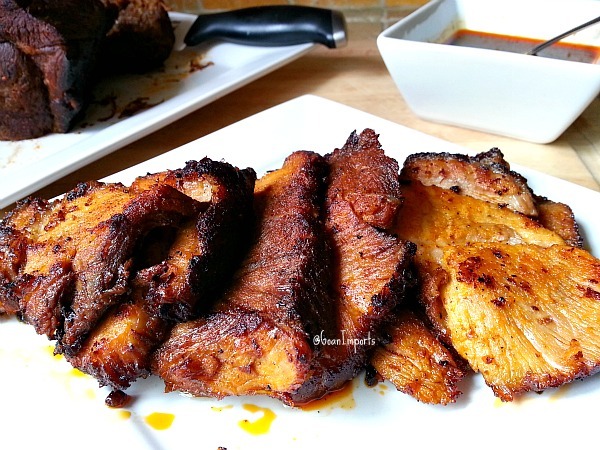 Cut the meat into nice thin slices and heat a pan add the fat from the gravy and fry each side for 3-4 minutes. Arrange the slices on a serving plate and pour the gravy on top or you can serve it on the side. 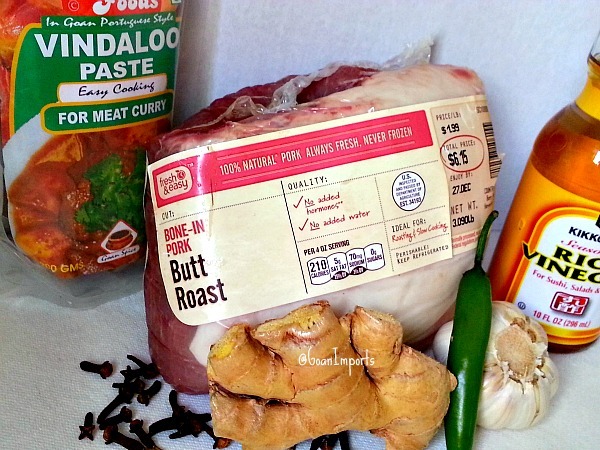 This pork roast is so flavorful you and your family will truly enjoy it a lot just as my family did. Your pork roast shot looks great! I like the composition and lighting. (Thanks for “Liking” my Book Reader’s Blog posts). Fantastic recipe! Looks so doable from your post! Will try! Salivating just looking at the photos! Nandini: Thanks for your like … Post Line, on Elm Drive Images. Have a good day. Where can I get the vindalo masala? Online? Yes online and below is the link. Hope this helps. Thanks for the likes of “True Blue Event Spotlights the Power of Sports Beyond the Field” and “Destination – Dog Lane Cafe” – much appreciated! Thank you for the like of “Destination: Clinton Crossing”. Much appreciated! Seriously Love anything spicy and this looks awesome! Thanks so much for stopping by my blog and the like!! Thank you for the like of “New England Patriots Win Super Bowl, Defeat Seahawks: ‘From Sea to Shining Sea’ We Had It Covered” …. in the Northeast we are in the middle of another major snowstorm so the Patriots Victory Parade in Boston will be delayed. But it sure is beautiful! Congratulations on your teams victory and stay safe. Thanks amid a blizzard here in Connecticut for the like of “Legendary ‘Remy’s Grinders’ Reappear for Super Bowl Sundays” ! Thank you for the like of “Behind-the-Scenes of Creative Collaboration” – Silk City Chorus & UConn Puppets. Much appreciated. You are so welcome Jackie. This looks incredible, I cannot wait to try it! Pork is very cheap in Australia and I love a good roast. I did not think of having pork at Christmas because its always Turkey(we often have chicken)! Thanks for the excellent recipe and step by step. Fantastic! Thanks Dawn :-). Loved you recipe of beef and cabbage soup. I love soups. Merry Christmas! Thank you so much :-). Merry Christmas!